How Much Truth Is There to Those 'Speed Enforced by Aircraft' Signs? We've all seen the signs along the freeway warning us of eyes in the sky looking for speeders. A Bay Curious listener wanted to find out if someone really was up there ready to hand out tickets. very time Aaron Perry-Zucker drives down I-5 between San Francisco and Los Angeles, he sees the signs: "Speed enforced by aircraft." But he's never seen an aircraft issue a ticket, and he can't imagine how that even would work. "It never really made sense," he said. "It didn't seem believable." Are there really helicopters and airplanes patrolling Bay Area traffic? How do they ticket someone from the air? Or, he speculated, are the signs simply an exaggeration meant to deter speeding motorists -- without any real aircraft on patrol? Jim Andrews says those signs are definitely real. And he should know. He's been a California Highway Patrol pilot for decades. "We don't necessarily set up as many specific speed enforcement details as we did 10 or 15 years ago, predominantly because of the advent of Lidar," said Andrews. (Lidar lets officers use lasers to pinpoint the speed of a vehicle.) "But there are still circumstances where we are definitely valuable, where traditional ground enforcement may not work." It's easier from above, for example, to see drag racing or drivers crossing the double yellow. 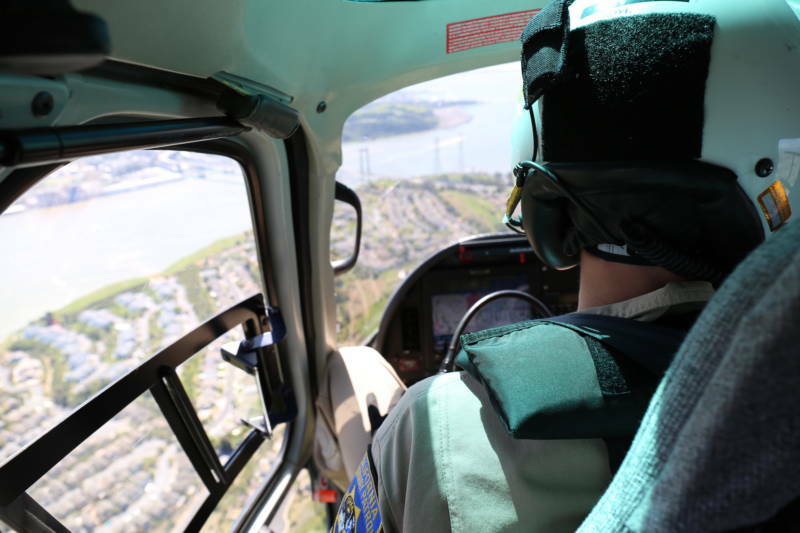 To find out how it all works, I climbed into one of the two helicopters that serve the CHP Golden Gate Division, which oversees all nine Bay Area counties. The air enforcement office also has two small airplanes at its headquarters at Napa County Airport -- but that's it for the fleet. Each aircraft has a pilot and paramedic on board, both CHP officers. That makes for cramped quarters in the back, where I stuff myself in between emergency equipment: oxygen tanks, a stretcher and medical supplies. 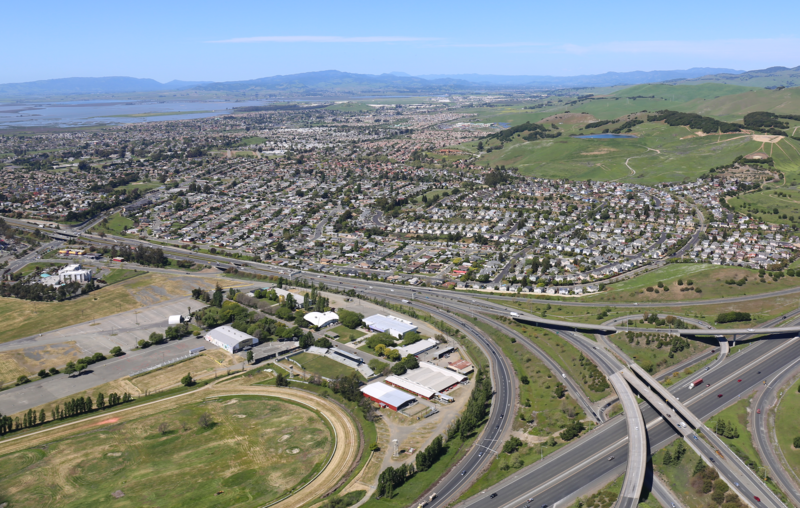 But as soon as we're flying over I-580, it's easy to see that Andrews is right. From up high, you can quickly get the lay of the land and spot speeding cars. You can also get nauseous really quickly. While we fly, radio calls come in from different voices and agencies. I can’t decipher them all, but Andrews points out a red car that officers have identified over the radio. "It's very easy to see. It stands out when someone's going considerably faster," he said. Pilots once used binoculars to spot the cars, but now the aircraft are equipped with high-definition cameras. Despite the technology, they still rely first and foremost on their eyes. After spotting a suspected speeder, Andrews has to confirm that the car is, in fact, speeding. It’s not a high-tech process. He simply flies low above the car at either the same speed or slower. On most freeways in the state, Caltrans has measured and painted perpendicular white lines every mile on the side of the road. You can see them from the helicopter window, or if you look closely when you drive by. Those are used to calculate speed. Andrews starts his stopwatch when he flies over one and stops it when he hits the next. He knows the helicopter's ground speed. And, since he's flying the same speed or slower than the car below, he can tell if the car is speeding. The officers in the air don't actually land and issue tickets. That might cause a traffic accident. Instead, they radio down to another officer in a more ground-friendly vehicle, who then pulls over the offender. Typically, that officer is waiting and ready to go at a predetermined location. Both officers' names are on the ticket and both must appear in court. CHP press officer Daniel Hill said they once ticketed a motorcyclist who was caught racing through the streets. He got all the way home and was then surprised when an officer knocked on his door 20 minutes later. Helicopters had been watching him from the air and captured him on camera. But How Common Is It ... Really? The California Highway Patrol used to rely heavily on this system of helicopters and small airplanes to monitor traffic, but these days aircraft enforcement has gone out of style. Budget cuts have rolled back the number of CHP aircraft and their total flying time. The small planes used to go on speed patrol once or twice a day. Now, they simply monitor speed while on general patrol for other things. "It never was cost-effective for [helicopters] to go out and loiter over a section of freeway," said Andrews. Speed enforcement by aircraft has become especially rare in the last decade, since radar and Lidar devices made it possible for officers on the ground to catch speeders more efficiently. Radar, which uses Doppler waves, sends that signal out across all lanes of traffic -- feeding back whatever are the fastest and slowest speeds on the road. But it's the relatively new precision of Lidar, or Light Detection and Ranging, utilizing laser technology, that has truly been a game changer. Hill said it is impossible to say exactly how many tickets are issued each year by aircraft. That kind of data isn't tracked in their database. But he admits it's not many. There are around 1 million traffic tickets issued annually in the Golden Gate District, so I asked: Is the number that comes from aircraft 10 or 10,000? "It's closer to 10," said Hill. And as long as there's any chance it could happen, those "speed enforced by aircraft" signs aren’t just a scare tactic. They legally have to be posted, no matter how remote the possibility. "In the Bay Area, the only place I've ever dealt with it is out on 280," said John Stanko, a traffic defense attorney in the Bay Area for the last 20 years. He's defended a few clients who were ticketed by aircraft in that area, and said it's most common in rural areas. It's possible to fight an aircraft-issued ticket, just as it's possible to fight a regular one. The speedometers in CHP cars must be calibrated every three months. Radar and Lidar devices must also be checked before each patrol. Officers must complete three days of radar training, in addition to Lidar and visual estimation training. To be certified, they have to accurately estimate within 5 mph the speed of multiple cars during a test. To use radar or Lidar for ticketing on non-highway roads, there also must be an up-to-date traffic and engineering survey for that road on file. Those surveys determine the 85th percentile of speed for all cars driving on that road. The speed limit then has to be set within the nearest 5 mph increment of that 85th percentile. You can see how on surface roads, where almost everyone drives significantly faster than the current posted speed limit, this can be problematic, Stanko pointed out. If officials want to set the speed limit higher than the 85th percentile, they have to "justify where they set the speed," said Stanko, meaning arguments must be made for unique or unsafe conditions. Again, both the air and ground officers have to appear in court if you choose to take the issue to court. Stanko also objects to the calculation of speed using a stopwatch from the helicopter and believes it's more challenging for officers to identify a driver from the air, or to prove that they have the right person once the officer on the ground writes the ticket. "There are a lot of arguments against these tickets," he said, though he acknowledges they can be hard to win. There also have to be signs posted at specific heights and sizes -- those signs that our question-asker, Aaron Perry-Zucker, sees on Highway 5. If budgets are tight and speed enforcement by air is rare, then why use the aircraft at all? "We're patrolling the whole Bay Area," Andrews said in the helicopter. "We're available 24 hours a day, seven days a week." 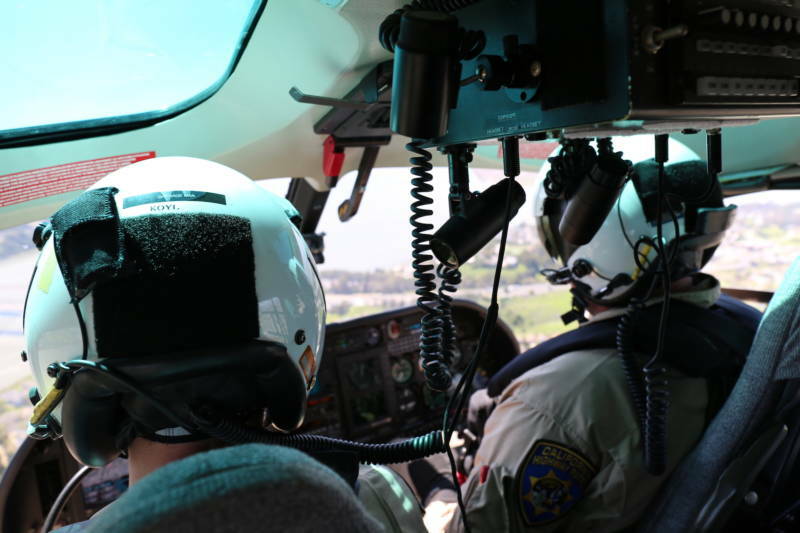 The CHP aircraft can respond to incidents that local police or agencies don't have the resources for. The entire time we're in the helicopter, Andrews keeps saying "anything can happen" when he's on patrol, and you never know what's coming. I'm skeptical. How much can happen on a brief speed enforcement helicopter ride? What can they really do on patrol from up here? But then a call comes in over the radio. It involves codes and numbers and the stilted shorthand of emergency personnel and law enforcement, but I do catch a few details: 10-year-old male down, possible hit-and-run, juvenile on bike hit by a car, med-evac requested, someone is en route. Andrews responds: This is CHP, we're closer than whoever's already been called, one minute out and available. Wave us in if needed. Suddenly we're descending into a parking lot in Richmond as the paramedic leans out the open helicopter door to guide Andrews into the painted asphalt circle that serves as a landing pad -- while I try not to throw up and make things worse. The chairs and equipment are quickly pulled out and rearranged, and a boy -- conscious and without any obvious major injuries -- is strapped to a stretcher across the floor of the helicopter. 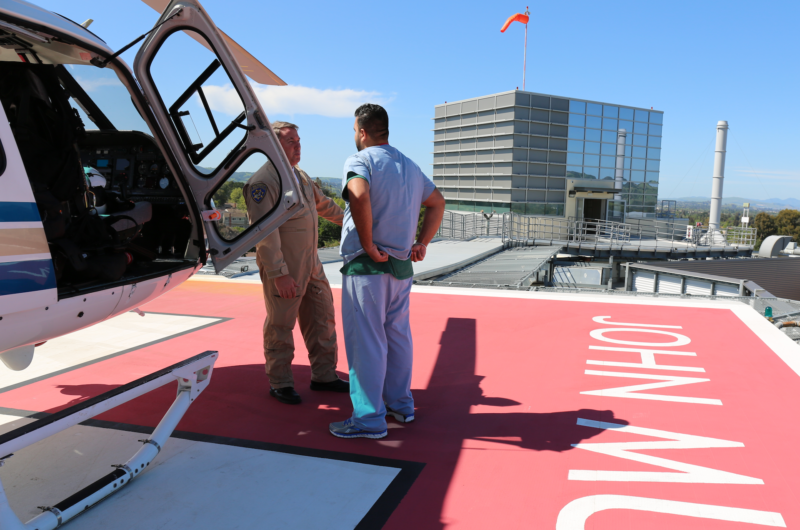 I wedge myself back behind the pilot's seat and within 25 minutes from when the call came in, we've delivered him to the roof of the John Muir Medical Center in Walnut Creek. After it's over and we're back at the CHP's air enforcement office at Napa County Airport, I ask about a sign on the wall: "Speed enforced by drone." It was a joke made by a Marin resident and gifted to the office. But don't worry, said Andrews: "I don't believe that's ever going to happen." Drones capable of monitoring traffic would be even less cost-effective than helicopters, he said, and a drone wouldn't be able to med-evac anyone.